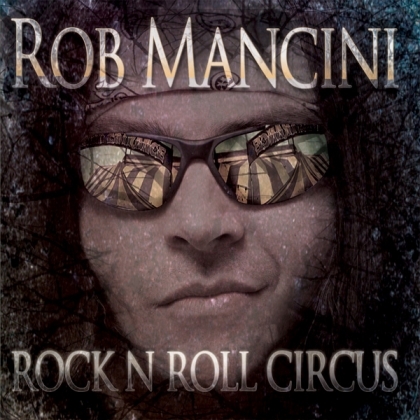 ROB MANCINI sure sounds familiar, but he has been on a ten year hiatus from recording. German-Italian musician and producer Rob has only been active on the Irish club circuit, plus as a session musician. Something compelled him to return, probably memories of past glories with bands like CRUSH and HOTWIRE, sharing the stage with bands like DARE and VICTORY. Today the music is described as late eighties and early nineties, like BON JOVI meets NICKELBACK. A cover of Kate Bush and mastering by Harry Hess, will that do the trick? First up the sound is very ok, quite clean and suits the music. Rob has presence in his voice and he seems to handle pretty much all instruments himself. An intro seems compulsory before the cliché like title track offers its light rock. But luckily the single cut “Edge of a Broken Heart” (nope, no cover), which is offered in two ok versions, makes you realize that the eighties was a fine period for music. “Stranger in Paradise”, “Everytime You Cry” and “Too Late to Die” follows suite. The movie hit song character is very pleasant and sure feel convincing. But the confusion in “Time Stops for No One But You” makes me visualize an unwilling conjunction of a piano and SOUNDGARDEN´s classic “Black Hole Sun”. The rest is closer to comfort than that, always radio friendly, but never really hitting the magic it button. Still Rob´s return is not poor in anyway, it´s more like solid. The circus may well hit town again soon.